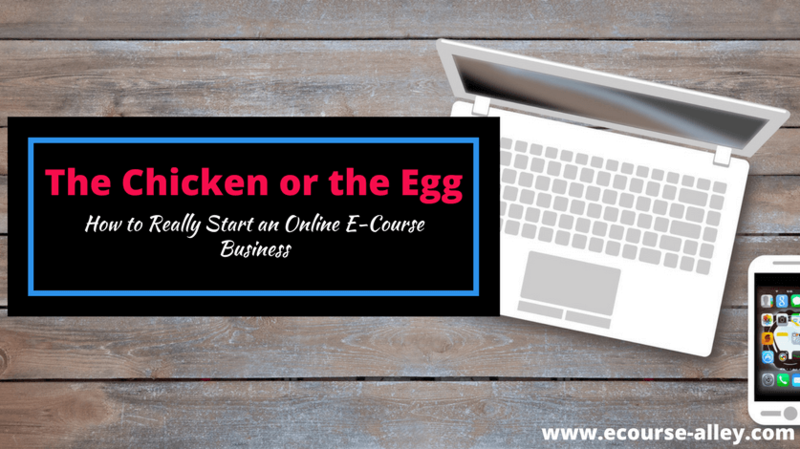 I was brushing my teeth one morning and thinking about how I got started and how no one was or maybe still is talking about the 'chicken or the egg' phenomenon regarding starting an online business such as an online e-course business. There are a lot of resources out there and advice on the internet, but most don't really address how to REALLY get started in the online world. I mean, they may talk about growing your email list and tips and tricks to do this or how to get more subscribers to your website or how to get more students to take your e-course, but what if you don't yet have an email list, subscribers, students, or even a website yet? Where and how do you really get started from scratch? I'm sure there are many ways to start from scratch, but I will show you how I did it and how it worked for me. So here we are. I am going to explain to you the ORDER I executed the beginning stages of my business, in order to build it from the ground up. I know this may sound strange for this to be the first step, but bare with me here, because if you do this first it will help you IMMENSELY later. Now, building a following is discussed a lot but I 'm not talking about once you are established, as I just indicated above, I'm talking about building a following in your niche even if you don't have your own website, content, e-course, e-book, etc. Set up a Pinterest account and start some boards directly linked to what you want to start an e-course business in, or any online business for that matter. Then, start pinning what you find on the internet (create your own pins with a program like Canva if you are game) or re-pin other people's pins. Make sure you focus your boards on different topics related to your niche and find high quality pins if you are re-pinning. Also, make sure to check out the websites of the content that you re-pin to verify that you are referring your audience (that you are attempting to build) toward quality information. Another thing to do that is very important is to follow others who follow you. But only follow those who are offering quality information and could potentially help you or become a colleague to potentially partner with in the future, for example through affiliate marketing. Similar to Pinterest, create a Twitter account that will later become your business Twitter handle. If you know what you will call your business, then great! You can use this as your Twitter handle, if not, don't worry as you can update this later without losing any followers. Similar to Pinterest, start following others in your niche by searching for key words. Follow people/businesses who are also posting quality tweets and start re-tweeting ones you think will be of most benefit to the audience you are trying to grow. I suggest also looking up some of your Pinterest followers on Twitter and following them as well. If desired at this point, take a similar approach to gaining a following/an audience on other social media platforms. However, I would keep it pretty simple to start and then you can branch out later. To be a success, you need to build a solid foundation. I mean, you wouldn't build a house without one, well, the same goes for any online business. Now, since the aim of what I do is building successful e-course businesses, I will focus on this niche. There are different ways to go about developing a solid foundation, but I will talk about two of the approaches you could take. It just depends on whether or not you want your own custom domain name and website right away or if you want to start selling your e-courses before you build up your brand. To be a success, you need to build a solid foundation. I mean, you wouldn't build a house without one, well, the same goes for any online business. For this approach, you will need to start by building your brand. This means figuring out what your business will stand for as well as building your logo, color schemes, and so on. You will have to set-up your Home Page and your About Me, Resources, and E-course Sales pages. It would also be a good idea to create a few blog posts to start in order to help bring traffic to your website and demonstrate the expertise you have in your niche. You will also want to create free content that you can offer to your audience in exchange for them adding themselves to your online community. This is referred to as your "opt-in freebie" and helps you further establish your expertise and authority with your audience. Lastly, you will want to link a third-party e-course hosting platform to your website, such as Thinkific or Teachable. This means that even if you don't self-host your e-courses on your website, you can use your website as the "home base" to direct your audience back to in order to showcase other aspects of your business, be it blog posts or free resources, and ultimately try to increase conversion of your followers/students to subscribers of your business's online community. There are several platforms out there now to help you run your e-courses. I could do a whole blog post just on this one topic! 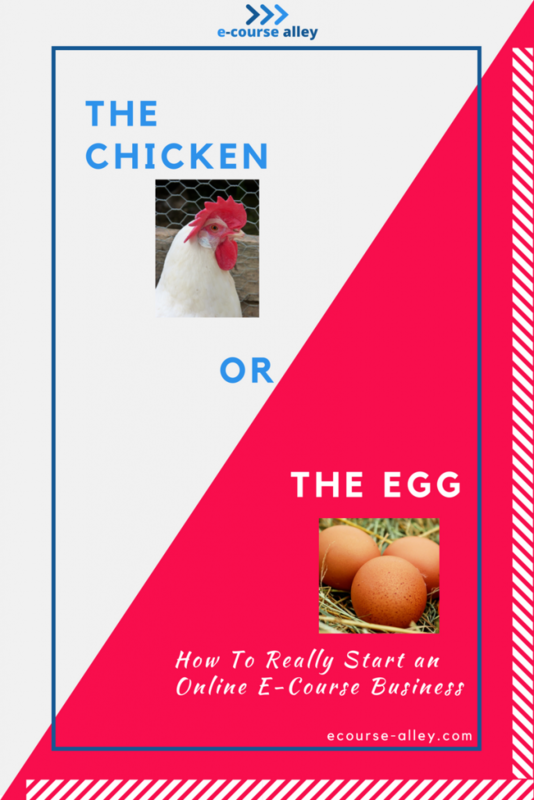 But, for the sake of this article in which I am focusing on how to determine what to do first from the 'chicken or the egg' perspective, I will give you a condensed breakdown on what this option of building a solid foundation may look like using only a third-party e-course platform. So, to begin with, not all platforms are created equal. You will have to start off with a bit of research to figure out what works best for you. For example, for every sale you make, platforms will take a cut of your profits, some more than others, since this is one of the ways they make their money. Also, some platforms allow you more control of your e-course business than others in that they allow you to know who registers for your course and they give you the ability to connect with them. Other platforms control the marketing of your courses and they don't disclose to you who has signed up to take them. Therefore, the bottom line is that you need to weigh the pros and cons of each platform and decide what will benefit you most in the long run. One tremendous benefit to only using a third-party platform as your foundation for your e-course business is that it will allow you to start selling or pre-selling your e-courses much sooner and allow you to have more time to work on content creation. Why is this so? Well, if you "skip" building a website (at least while you are new to e-course creation), you can focus more on just creating your e-course(s) and on marketing and sales. However, the flip-side to this, as there is always another side to the coin, is that you will probably not have your own custom domain name as you will have to use part of the third-party company's name in your URL and also probably as part of your business's email address. Overall, I have outlined here two options to building a foundation for your e-course business. It is now up to you to decide which path you want to take. However, ultimately in the end you will eventually require a website of your own, so if it were me, I would start out with Option A. No matter what option you chose from step 2, you will want to pre-sell any e-course you create even BEFORE you finish creating all the content. I know this may seem odd at first, but it really is the way to go. You want to make sure there is a demand for your course before you put in a lot of hard work and effort to produce it. I mean, what would happen if you spent a couple months creating an e-course only to start selling it and find out that it isn't what your audience wants! Therefore, if you pre-sell your course and market it on different social media platforms that it is "coming soon," you will be able to observe if it is something that will at least be worthwhile for your audience. The #1 Goal of a pre-sale's page is to persuade people to sign up for your e-course ahead of time. So, make sure the problem you will solve for you audience with your upcoming e-course is crystal clear. Offer different payment plans as part of your pre-sale. Sometimes what happens is that a potential student wants to buy your course but they can't afford the full cost up front. Therefore, make sure to offer a payment plan to allow your audience to pay in installments. Include in your pre-sale a bulleted, high-level list of the main topics in your course and what your audience will be able to "take-away" from the training and use themselves for their own endeavors. If you get asked any questions via social media or email during the pre-sale, make sure to answer all questions that your audience has and add any that keep coming up to an FAQ section of your pre-sale campaign. Include images/videos as part of your pre-sale and use some of these to promote your e-course on social media platforms. Include bonuses for enrolling early in your e-course, like a reduction in overall cost, free resources that can be downloaded, one-on-one coaching with you, etc. So there you have it, my three step initial process for starting your online e-course business from scratch. There still isn't an easy answer to which came first: the chicken or the egg, but at least you can see that it is a bit of both, you have to hatch a plan (haha hatch!) and then multi-task on other aspects in order to build a following that will help you when you actually start to launch your pre-sale campaigns for your e-courses. You have to hatch a plan and then multi-task on other aspects of your business in order to build a following. I hope this has helped you in some way. Please leave a comment or if you have any questions feel free to ask and I will reply as soon as I can! Or, better yet, sign up below to become part of the e-course alley community and as a BONUS you will get access to my exclusive ECA FREE Resource Library to help you along your e-course journey.